As the festive season is fast approaching, we are all planning and preparing to cook, eat and share the most wonderful foods. 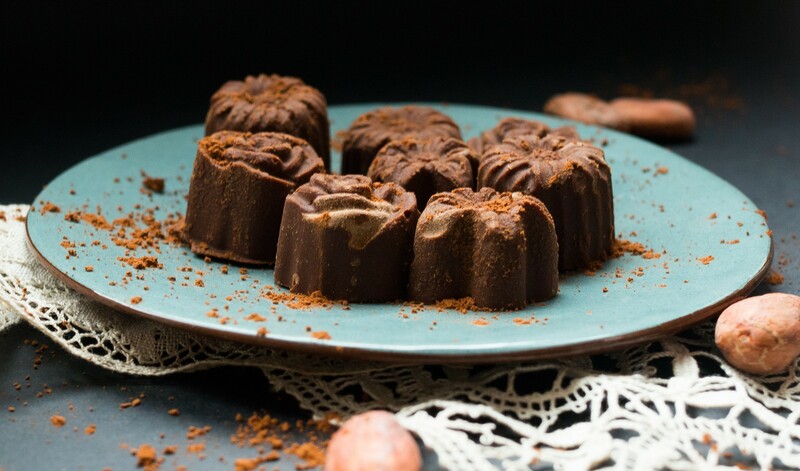 So what could be a more appropriate time to talk about one of the most eaten delicacies, the food everybody loves, the ‘food of gods’ : chocolate. We English are the biggest consumers of chocolate per capita, eating an average of 11.5kg a year each. From the fine dark chocolates to the mass produced confectionaries, chocolate is very much taken for granted in the western world and there is little appreciation for the lengthy process and complexities involved in creating a bar of chocolate. 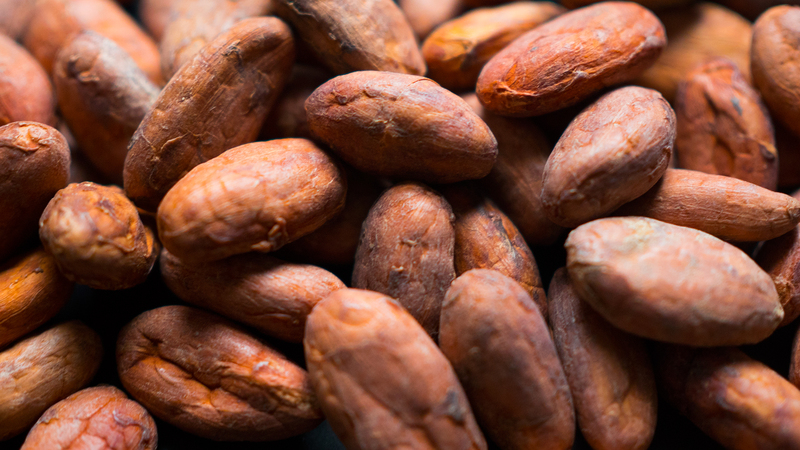 The cacao beans come from the cacao trees ‘Theobroma cacao’ which is Greek for ‘food of the gods’. The cacao trees originate from South America where they were first cultivated by the Mayans around 600 BC. They then traded them with the Aztecs who roasted and ground the beans to make it into a drink used for religious ceremonies. The Aztecs valued the cacao beans enough to use them as a form of currency. Nowadays most cacao is grown by the 2.5 million cacao farmers on smallholdings in West Africa (Ivory Coast being the largest producer). The cacao trees need to be planted in hot and damp climates next to tall trees in order to protect them from direct sunlight often amongst papaya and mango trees. It takes 3 to 5 years before the cacao tree bears fruits and once mature each tree produces around 1,000 beans a year, which may seem like a lot but it is only enough to make 1kg of chocolate. The trees bear large fruit pods from its trunk each containing 20 to 40 seeds or cacao beans which are embedded in a white pulp. When the fruits are ripe the farmers break open the pods and put the pulp and the beans in a large pile to ferment in the tropical heat for anything between 2 to 8 days. During this period the sugars in the pulp ferment and the bacteria penetrates into the beans breaking down the astringent particles and creating a wide variety of desirable flavours and flavour precursors that will be developed in roasting. This is one of the least controlled parts of the chocolate making process but it has a massive impact on the taste of the final product. Poorly fermented beans will give the final chocolate unpleasant aromas. Sometimes if the beans are left too long they will go mouldy and sometimes the fermentation process is skipped entirely. It is up to the buyer to determine which beans have been well fermented and select them for their flavour potential. Once the beans have fermented they will be dried to preserve them. The main method of drying is still to lay out the beans in the sunshine for several days, although sometimes they are dried over stoves or heaters to speed up the process. At this stage the beans are still very far from being anything like the chocolate we know and love, they are bitter, dry and astringent. The transformation from these beans into a chocolate bar is complex and very rarely happens in the same place as the beans are grown, instead they are shipped to Europe and America where the beans are made into chocolate in large factories. To get an idea of how far removed the growers are from the end product watch this video showing cacao growers in the Ivory Coast trying chocolate for the first time. On arrival at the chocolate manufacturer the cacao beans will be gently roasted to develop their flavours further. The beans are then cracked open and the ‘nibs’ are extracted and the husks are discarded. To transform the nibs into a solid bar of chocolate which is glossy, smooth and with a good ‘snap’, they have to be put through various stages of milling, refining and tempering. The reason chocolate is so appealing to us is that it is one of the few food products that melts at body temperature so it literally melts in your mouth. Also after the roasting and refining it has an extraordinary 550 flavonoids (a carrot typically has 96), it is literally a flavour explosion. The industrial processing of cacao was first developed by a Dutchman called Conrad van Houten in 1828. The chocolate manufacturers Fry and Sons in Bristol then made the very first chocolate bar in 1848. By the end of the 19th Century the Swiss company Nestle had developed methods for creating ultra smooth chocolate and incorporating powdered milk. The milk chocolate bar as we know it was born. A fine quality dark chocolate will contain around 70% cocoa solids the remaining 30% is sugar. Mass produced chocolate is made with a minimum amount of cocoa solids and the maximum amount of sugar and milk, in fact most ‘chocolate’ in the UK contains less than 1% cocoa solids. The reason chocolate gets such a bad reputation for health is simply because of the large amounts of added sugars. In fact cocoa itself is really exceptionally good for you. Although it is high in saturated fats it is a specific fat that does not raise your cholesterol. It is high in potassium and is number one for magnesium after seaweed. It also contains phosphorus and calcium, which build bones, tissues and nerves in the body. If you eat cocoa in it’s raw form (ie not roasted) the nutritional benefits are massively increased. Like all seeds cacao beans contain all the nutrients and fatty acids for the seed to germinate and grow into a tree. Cocoa has an incredibly high amount of antioxidants it has been linked with anti ageing and it has at least seven phenathalamines, which are the ‘love chemicals’ or aphrodisiacs. However these get destroyed in the roasting process and then if you add milk in, it binds itself to the antioxidants and prevents us from absorbing them. It is getting easier to buy raw chocolate from health food stores, Mu has recently been on a workshop learning how to make our very own raw chocolate with The Raw Health Bar in Brighton. A friend of ours recently moved to Ecuador and has been working directly with the cacao farmers there and he has kindly shared some of his knowledge and experience of the industry with us. Growing cacao does not require huge amounts of space and most of it is done on small scale farms but the farmers are not paid enough for their beans so more often than not they use logging of the rainforest to subsidise their income. Unless it is a protected reserve, if you own the land you can log as much as you like on the property. The logging companies know that cacao producers earn very little and they put pressure on them to sell the trees and the land. The second main problem is that the buyers and intermediaries will not discern between good and poor quality beans and they will offer the same price for them. This has a knock on affect where there is no incentive for farmers to grow a high quality product. For organic producers in particular, the certification is often tedious and long with many trainings and a lot of paperwork. To then have to sell the beans at the same price as non organic means it is often simply not worthwhile for the farmers. But times are changing with the US and some parts of Europe (mainly in the UK) consuming more organic chocolate. Hopefully if the market for organic chocolate keeps growing, it will then encourage the producers to turn to organic certification. Fair Trade chocolate also faces similar issues. Even though small producers have benefited from Fairtrade International’s support: gender equality, training on the organic certification, knowledge on climate change, better livelihoods, offering educational opportunities to children in the communities, access to health, etc, the impact is still too little and the Fairtade minimum price is often not much higher than the market price. As of 2014, less than 1 % of the chocolate market was Fair trade. It is us as consumers that can change this, by buying organic and Fairtrade, it will boost the market and encourage a more sustainable industry where farmers can provide for themselves and their families. Our friend Martin is working on a new project in Ecuador in the Choco rainforest where the cacao producers are making a very high quality cacao and asking for a high price. The extra money is then re invested in conservation and research and also saving one of the most endangered species on our planet, the brown headed spider monkeys. Here’s a little video that Badj helped to create that explains the project and a link to the fundraiser, please support it. By spending a little extra on your chocolate you will not only get a much better tasting chocolate but you will be helping the farmers that grow the cacao to make a sustainable living, so they don’t have to destroy the environment and hopefully they too can enjoy the delights of the ‘food of the gods’. 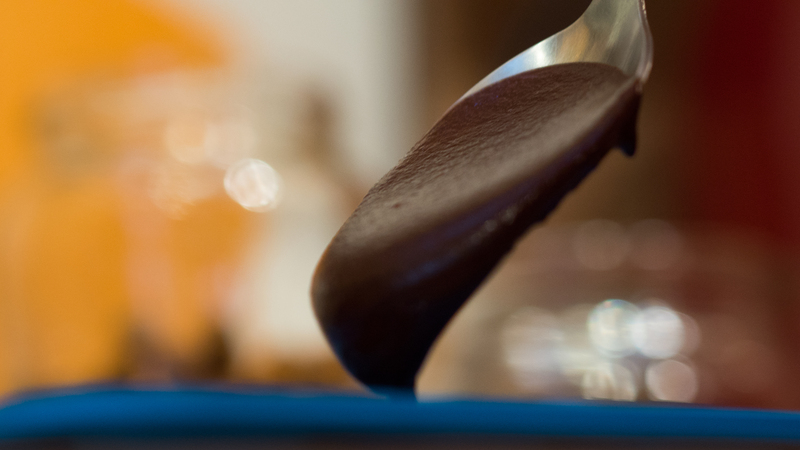 Melt the cacao butter over a bain-marie. The water needs to be no higher that 50C. Once melted add the cacao powder and stir. Then add the carob and lucuma still stirring over the bain-marie. The chocolate mixture should reach a temperature of no more than 31C. If it gets too cold and stiff, discard some of the cold water in the bain-marie and replace with hot. 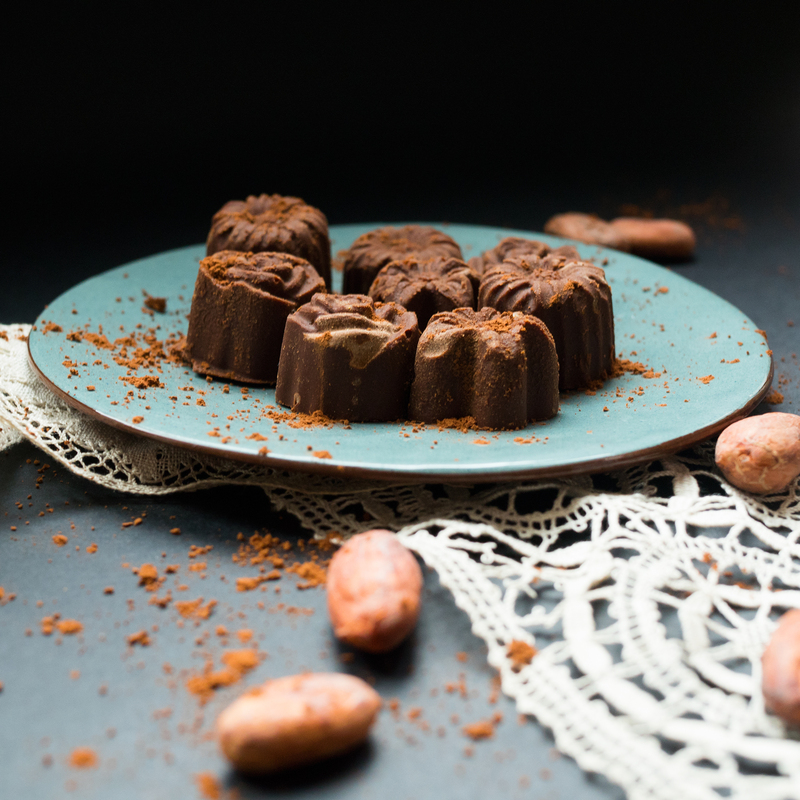 When you have reached a shiny and runny consistency, you are then ready to pour the chocolate into the silicone molds. You can then add your favourite ingredients either in the chocolate or directly in the molds. Place in the fridge until the chocolate have set. When ready take out of the molds and store in the fridge.